HuntingNet.com - May Giveaway Contest! 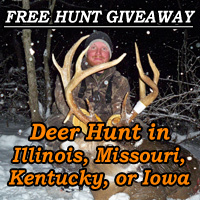 HuntingNet.com and IMB Outfitters are partnering up to offer our members a chance to win one of three hunts. All you have to do is participate! Step one is to click and fill out an IMB Outfitters brochure form here. Next, post your name and a picture of you on your favorite hunt in the contest thread. Once the contest has come to a close, eligible contestants will be selected at random by HuntingNet.com staff and winners will be announced on June, 17th. Want to know more about the prizes? 1st Place - The winner will receive a free Whitetail Deer Hunt in renown Pike County, Illinois with the only cost to the hunter being his hunt tags. 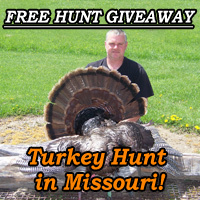 2nd Place - Contestant will receive a free Spring Turkey hunt in the State of Missouri. Shelby County, Missouri is among the top 5 counties in the nation for trophy turkeys according to the National Wild Turkey Federation. It's normal to hear a couple dozen gobblers every morning within calling distance! 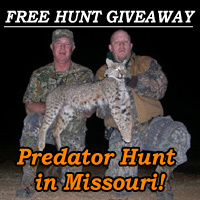 3rd Place - Wins a free Predator Hunt of Coyote, Bobcat and fur-bearing animals in the state of Missouri. All costs will be covered with the exception of the hunters tag. Contestants must be U.S. residents and 18 years or older, transportation is not included in prizes. Is this thread considered the "contest thread" or is there another one? Yes but where is the so called contest thread? Is this it? I am waiting to know that as well, I already filled out the IMB brochure. The op also says to post your name with the picture, I would think the administrators have our names from when we registered. Not only doesn't it say what flags is asking, but if you click on "Terms & Conditions" it comes up as an error and no page found! You should expect the "junk" mail soon - LOL ! Flags - No, this is NOT the contest thread. IMHO this IS the contest thread since clicking on the stuff in the OP brings you right back to this thread and there are no other threads about the contest on this site or the IMB website. I am sure admin will get the bugs out ...I do believe this is the contest thread.